Home/Thoughts from a Local/7 reasons I believe Falasarna is the best beach in Crete! Many of my friends ask me from time to time which beach I believe is the best in Crete. I always come up with the same answer, Falasarna. My answer is for sure objective, but as I was born and raised in Kissamos, the beach I love to spend my summers is Falasarna. The reasons that this is the answer are the following 7! 1. Turquoise waters and pure white sand! The main reason I love going there is the whole view of the place. Turquoise waters and white sand. The feeling once you see the area is unique. 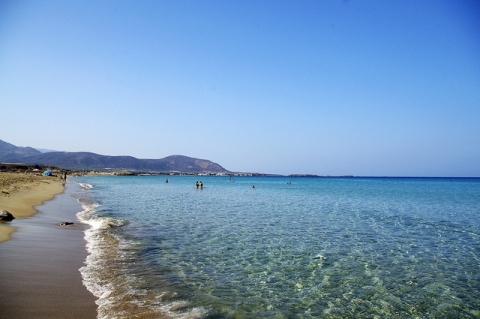 Falasarna beach has been awarded in the past as one of the best beaches in Greece, Europe or even the world. A picture is worth a thousand words, imagine when you enter the water. It is just 15km of paved road away from Villa Veghera, or 25 minute drive. On your way there stop on top of the hill to see the view and take some pictures! Falasarna beach is huge! The length of the main beach is about 1 kilometre long and 150 meter wide. There are also smaller beaches in a coastline of about 800 meters divided into smaller beaches. Even the busiest days of the summer there is space for everyone, especially for small kids willing to play with the sand. 4. Services available on spot! 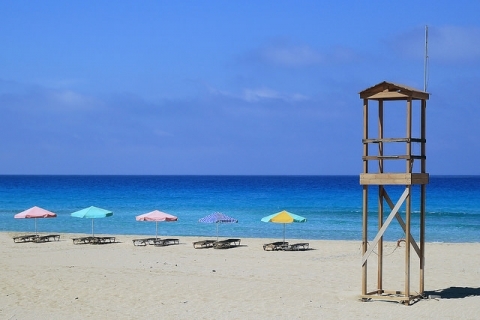 Falasarna is awarded with a Blue Flag, which means that it is an organized beach. Lifeguards are watching the beach, there are toilets and services provided. There are many areas with sunbeds and umbrellas to rent (about 7 euros a set a day) but if you want you can choose to sit on your own. A café/canteen and taverns are available in the entrance of each beach. 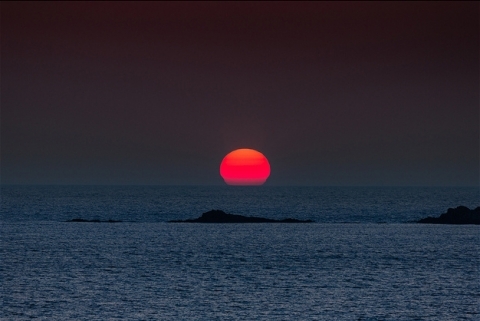 The sunset is just wonderful. It worth to go a bit later there and stay until the sun goes down. Actually, one café/bar. Its name, Orange Blue. On a small hill overlooking Falasarna beach and the ocean. One of the best locations to watch the sunset while having a beer or a drink. A really nice place and one of my favourite bars in Kissamos area. Last but not least, taverns. Many options with Cretan traditional cuisine. Nice food combined with nice views all the time. There are plenty of taverns, Galazia Thea and Kyma is our suggestions but in general, food is nice everywhere in Crete. 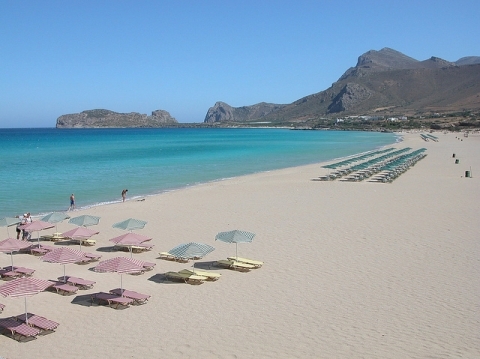 Being in West Crete you have the chance to explore many amazing beaches and not just one. Elafonisi/Kedrodasos and Balos/Gramvousa are unique places and you have to visit them for sure. Having chosen Kissamos for your vacation you have the chance to visit all of them really easy but Falasarna is the most convenient beach to reach even if you choose to swim there on a daily basis. All the info about the beach, café/bars and taverns are included in our Insider’s Guide of Kissamos area. Please feel free to request it with an e-mail. I will be happy to share it with you!